Preheat oven to 150°C/300°F. Add egg whites and salt to a kitchen machine with whisk. Once foamy, add some sugar and beat for approx. 5 – 8 min. or until stiff peaks form. Add starch, vinegar, and half the vanilla extract and beat to combine. Add cinnamon and fold gently with a rubber spatula. Transfer to a baking sheet lined with a silicone baking mat and gently flatten the meringue into shape. Reduce oven heat to 130°C/260°F and bake at for approx. 1.5 hrs. Remove and let cool. Meanwhile, peel a pear and apple. Quarter, core, and dice them. Toss diced fruit with some lemon juice in a small bowl, then transfer to a small pot. Split and scrap vanilla bean and add the pod and seeds to the pot. Add tarragon, some sugar, and set over medium-high heat. Let simmer for approx. 10 min. Add remaining sugar to a saucepan over medium-high heat and let caramelize. Once amber in color and completely dissolved, add heavy cream and stir to combine until thick and smooth. Add butter, stir to combine, and set aside. For the poached pears, peel remaining pears. Quarter and core them, leaving stems for added decoration. Transfer to a saucepan with lemon juice. Add caramel syrup and heat over medium high until mixture boils. Remove from heat and let sit for at least 15 min. Add mascarpone cheese to a kitchen machine with paddle. Add confectioner’s sugar, remaining lemon juice, and remaining vanilla extract and mix until light and fluffy. 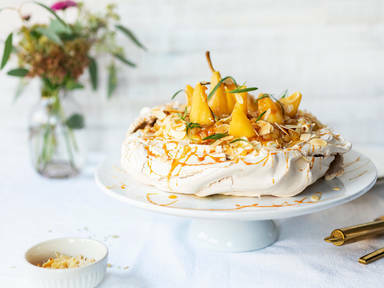 Top cooled pavlova with whipped mascarpone and apple-pear compote. Garnish with poached pears and fresh tarragon. Drizzle with caramel and sprinkle toasted, sliced almonds over the top. Enjoy!